The blood count makes you suspicious, given the significant thrombocytopenia. 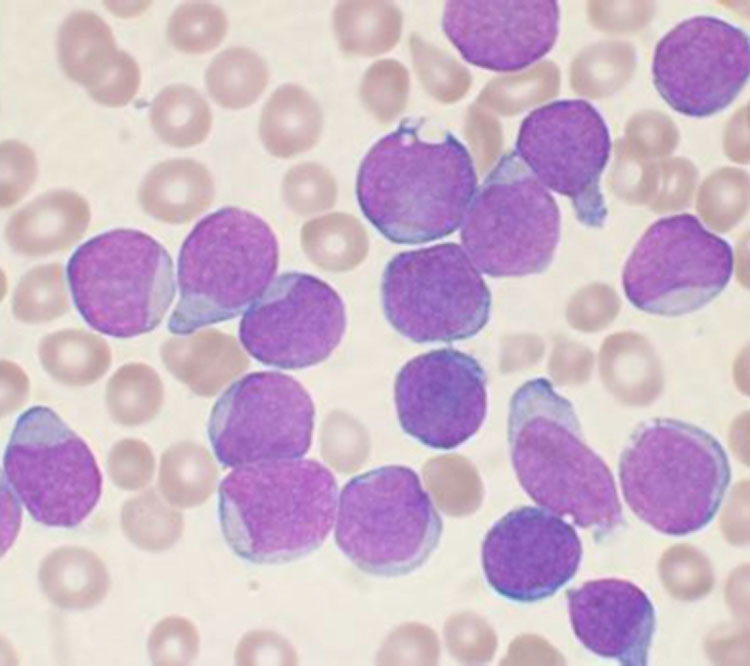 Blood film is the essential part of this film – However 20% of leukemic patients present with no evidence of blasts in the peripheral blood – therefore bone marrow biopsy is essential. This film shows classic findings in ALL leukaemia – including the mirror-handle cell! Weakness, feeling tired, or looking pale. In acute lymphoblastic leukemia (ALL), a lymphoid progenitor cell becomes genetically altered and subsequently undergoes dysregulated proliferation, with clonal expansion. The child is at risk of tumour lysis, and therefore hydration and allopurinol is appropriate, and monitoring of electrolytes. The cell markers confirm common B-all. ie, CD19, CD20, CD24, CD22, CD21, or CD79). CD10 is commonly expressed, which makes it a useful diagnostic marker. The presence of aberrant myeloid markers (eg, CD7) is occasionally noted but has little prognostic impact. B-cell precursors of ALL can be further subclassified as early pre–B-cell, pre–B-cell, or transitional pre–B-cell, but distinguishing these subtypes is usually not clinically relevant. Favourble prognosis: t(12;21)(p13;q22) or ETV6-RUNX1 (formerly known as TEL-AML1) and hyperdiploidy (>50 chromosomes/cell). Trisomy 4, trisomy 10, and trisomy 17 (”triple trisomy”) may be seen in some hyperdiploid cells and share the favorable outcome. Poor prognosis: Hypodiploidy (< 44 chromosomes/cell), t(4;11)(q21;q23) MLL-AF4 or MLL gene rearrangement, and t(9;22)(q34;q11), or Philadelphia chromosome positivity. Initially they are allocated to regimen A or B. A – WCC<50, and age <10yrs, or patient with downs syndrome. 3 drug induction with dexamethasone, vincristine and asparaginase. B – WCC>50, AND/OR age >10yrs, T-ALL, or lympohoblastic lymphoma. 4 drug induction with dexamethasone, vincristine, asparaginase and daunorubicin. In general, boys receive 3 yrs of treatment, girls receive 2yrs. This entry was posted in Acute leukaemia, Laboratory morphology, Paediatric haematology and tagged Blood film, Cytogenetics, Paediatric ALL, purpuric rash, trials. Bookmark the permalink.